It's been a great year for the Hot Club. Charles Frommer has been playing with us full-time now, adding sophisticated vocal harmonies, driving bass, and silky smooth clarinet to our sound. Fans can now follow us both on Facebook and Twitter. We've played some wonderful concerts and made new friends. Check out our calendar and continue supporting live music! We're looking forward to the new year and seeing lots of our friends out there. 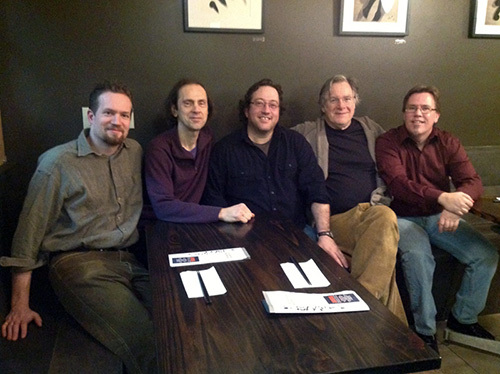 We play regularly at Gomen Kudasai in New Paltz, so check our schedule. It's a wonderful Japanese restaurant, featuring genuine home-style Japanese cooking. You won't find anything like it in the Hudson Valley. Below is a photo of us there after enjoying a wonderful meal. John Sebastian came out to hear us there (see photo below, second from the right), and it was great to meet and hang out with him. Be sure to visit our Facebook page as well, and join our mailing list to be notified of where we're playing next. The room was packed again, as people's hunger for hot jazz drove them to this oasis of acoustic music. Two lucky raffle winners went home with free CDs, and many others enjoyed the concert enough to buy their own copies. Thanks to everyone for supporting us! 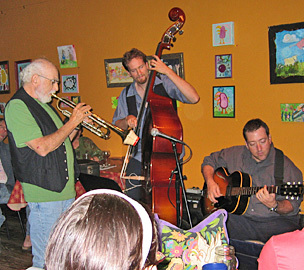 We will be back at the Rosendale Cafe soon, so keep you eye on their music calendar. If you want your own copy, click here! Or just buy one at one of our shows and save yourself the shipping cost. The rain was torrential, but that did not deter the many acoustic music fans who showed up for an evening of gypsy jazz. The venue was completely sold out by the time we started playing. This was one enthusiastic audience! Hal Lieberman joined us on trumpet for a few tunes, as did Ed Marris on accordion. The show was recorded live, and we'll be releasing a CD of the concert early next year. Thanks to all the folks at Unison for providing this wonderful space for musicians and artists to present their craft. 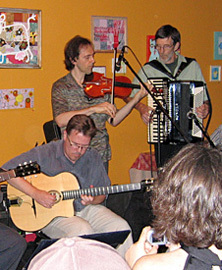 The group played to a standing-room-only house last night at this hip acoustic music haven in Rosendale, NY. We were all astounded at the reception we got. 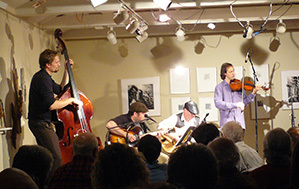 Gypsy jazz is definitely alive and well, and audiences are eating it up! Two special guests joined us for a few tunes: first, Aaron's father, Hal Lieberman, on trumpet; and later, accordionist Ed Marris. At the end of the night, the audience wouldn't let us leave, so we had both Hal and Ed join us for an encore as a sextet. Thanks to everyone who came and made this evening of music a big success! Martin Keith now joins us on acoustic bass. Martin has been playing bass for about 15 years. His lifetime love of music has led him to play in almost every style and genre, and he has performed with artists such as Vassar Clements, Peter Rowan, David Grisman, Chris Hillman and Herb Pedersen, Ben Perowski, and (of course) his father, bluegrass banjo innovator Bill Keith. This love for music also extends to his working life, building guitars and basses for Martin Keith Guitars. Welcome, Martin! Aaron Lieberman now joins us on rhythm and solo guitar. Aaron is a graduate of Manhattan School of Music, and is a long-time fan of swing music from the 20s, 30s, sand 40s. 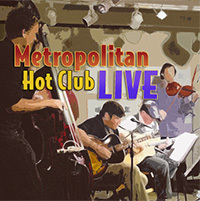 The word must be out: This style of music is more and more popular, and Metropolitan Hot Club is hotter than ever! Joining the trio for this gig was Mark Bernstein, jazz guitarist, adding solid rhythm and tasty solos, helping create that authentic Hot Club sound. The room was completely packed, and accolades abounded as the group not only perfomed a wide range of tunes, but enlightened listeners with little-known tidbits of information about Django Reinhardt, his music, and his influence on other musicians.